The Art of Warfare (TAW) is defined by its Code of Ethics. This is who we are. We hold our leaders and our members to the highest standards of anyone in the PC gaming arena. If you cannot commit to these standards, you should not apply to TAW. No TAW Member will use, store, or test cheats*. No Member will associate with cheaters while representing TAW. No TAW Member will glitch**. All TAW members will actively avoid glitches that they know, find or are informed about. No TAW Member will purchase unofficial resources for in game use. ** Glitch: use of any game behavior that is either undocumented or unintended by the manufacturer in order to increase one's personal performance or decrease the performance of others. Example: glitches in walls. TAW does not form alliances which will compromise its independent identity. TAW uses a Chain of Command (COC) in the organization of teams, relay of orders, and flow of information to achieve success on the battlefield. All orders from your COC must be followed at all times except when those orders contradict the Code of Ethics or other policy. Members must raise any issues or complaints through their COC. Members cannot jump over their COC. In the event that the issue or complaint is regarding a member’s direct COC, the member should submit the issue in written form and request it be forwarded up the COC. The member’s COC must forward the written issue or complaint to the next level of the COC. Each TAW member must participate in a minimum of two (2) hours of events per week which include your required battalion briefings that are set up and assigned by the CoC. Acceptable event types are determined by your Division Command. Events should not be on the same day back to back within your battalion, unless approved by your CoC. All events and activities will be held in the Primary TAW Team Speak within the assigned channels. Attending any event or unit outside of your designated battalion mandatory is optional but encouraged. Remember that you are a guest and a representative of your division. TAW accepts all real life needs and commitments. TAW will not put any member into a decision between real life success and TAW. If a member decides to leave TAW for any reason, the decision will be upheld. TAW members will respect each other regardless of their age, gender, nationality, race, religious beliefs/creed, or sexual orientation. TAW members will respect non-TAW personnel in the same way as TAW members. TAW members will show dignity, honor and integrity outside of TAW. Any insult towards the member, its unit, another TAW member or TAW as a whole are to be ignored and left uncommented. Members will respect and uphold their COC leadership as well as the COC leadership will respect and uphold their members. Any and all language or content of an adult or offensive nature will not be tolerated, whether on voice or text communications (chat, forums, email etc.). No TAW member will issue religious or political statements or respond to one of them. No TAW member will question TAW policies and regulations in public. They will instead use the COC to issue their thoughts. Good sportsmanship is mandatory at all times and in all situations. Members are representatives of TAW and are perceived as such by other persons and organizations. A member's public conduct, good or bad, will be reflected on the organization as a whole. 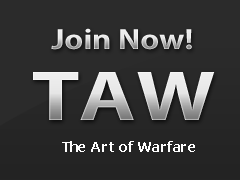 As a TAW member, you are not allowed to, as a member of another gaming organization, play a game that TAW offers. We expect that you will play that game with TAW and support our team! As a TAW member, do not share our strategies or tactics. Our field leaders work hard to develop them for their teams. We encourage members to wear their TAW tags with pride outside the games TAW plays, but this is not a requirement. Wearing tags or not, remember that you represent TAW at all times. We understand loyalty is earned, and TAW will work hard to earn yours, but we will not hesistate to remove members that violate these rules.